Start buy pouring the Midori liquor in your cocktail glass. Next, gently add the seltzer water. Obviously, add more water to create a weaker cocktail. The third step requires you to very carefully pour the black vodka on top of the other liquids. You might want to use a spoon to pour the black vodka in to the glass carefully. Thus, preventing the liquids from mixing together. Optional: Add a garnish of your choice. We took some radishes and then carefully peeled away the majority of the red skin. Be sure not to peel off all the skin in order to get the perfect bloody vein eyeballs. Next, carve a hole just large enough to put a blueberry in to the side of the radish. Please note that we chilled our liquors in the freezer prior to making this cocktail. Because, we did not want to use ice that would blend the cocktail up distorting the green and black layers. Be sure to do this, or add ice once the drink is served in order to have a properly chilled cocktail. 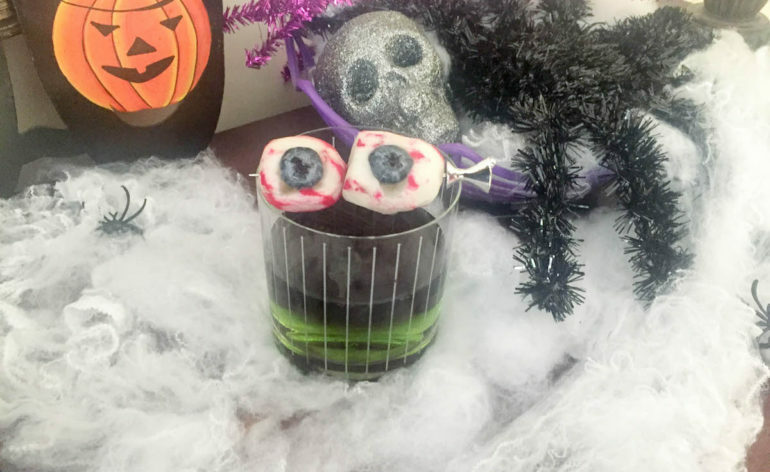 Since we have entered the month of October, today we will feature a Halloween vodka cocktail. 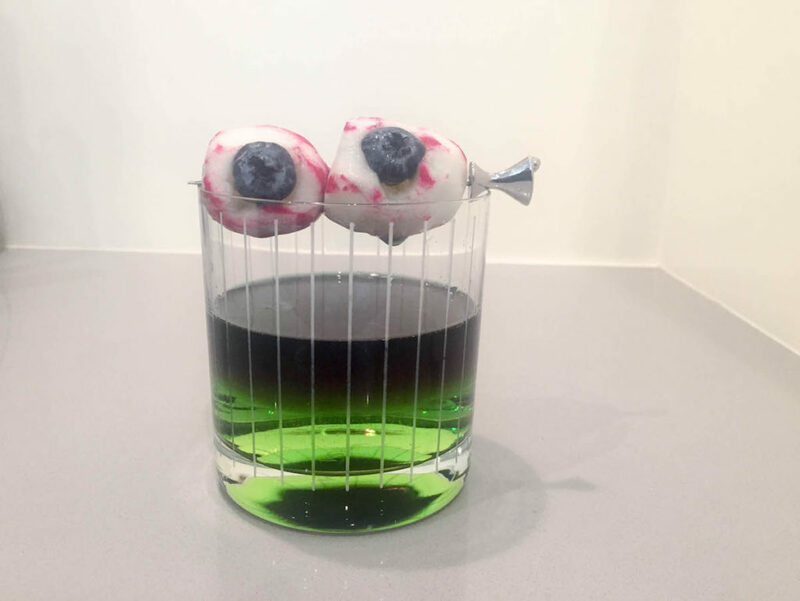 I decided to create a black and green cocktail for our first featured Halloween vodka cocktail this year. 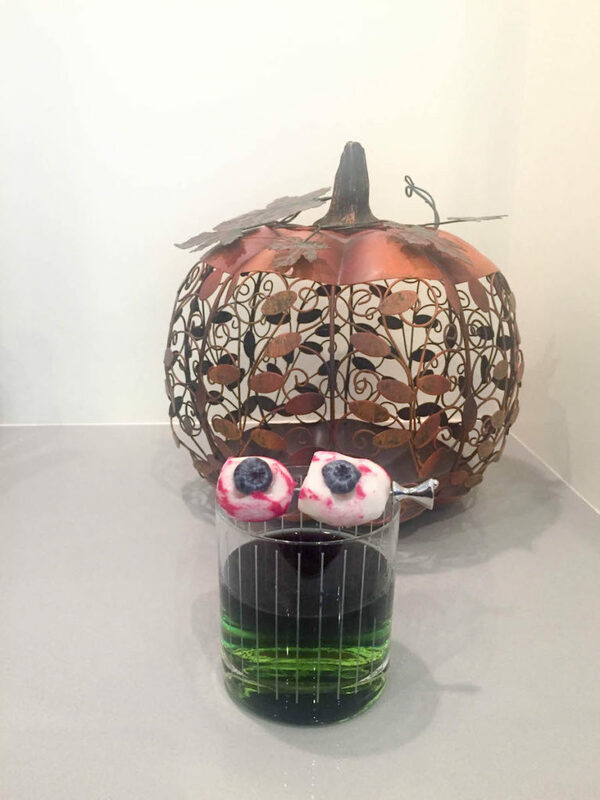 Be sure to check back often for more fabulous Halloween cocktail ideas. 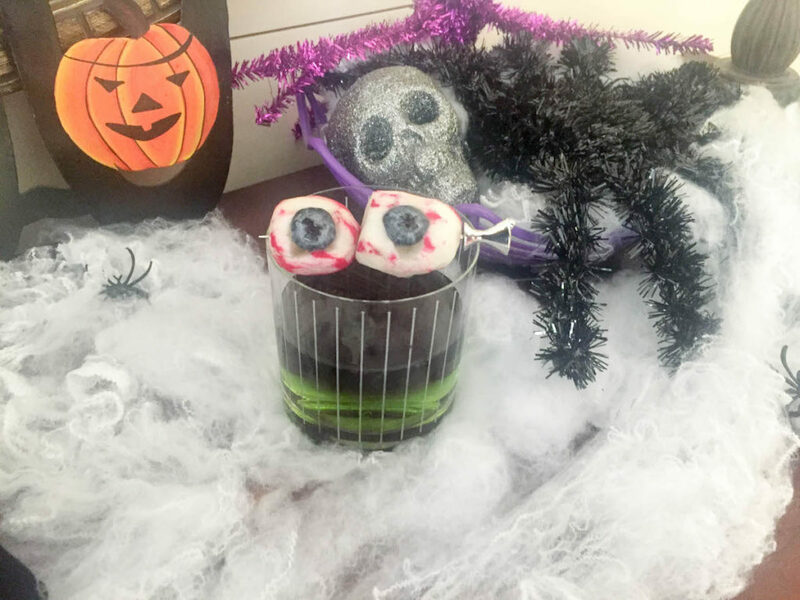 We are sure you will impress your guests using our Halloween vodka cocktail recipes! Also, check out our post on our Halloween screwdriver cocktail that was a huge hit a few years ago. Today’s cocktail is a layered cocktail. This is done by putting the liquids with the highest specific gravity in the glass first. The liquid with the lowest weights are added last. Basic vodka has a specific gravity around 0.97. And, Midori has a specific gravity of 1.05. So, for today’s cocktail we must be sure to add the Midori to the glass first as it is the heaviest. Next, we add our water (SG of 1.0). Finally, we add the black vodka that will stay on top of the green Midori liquor and create an awesome looking Halloween vodka cocktail that is layered in color. SimplyVodka.com is a participant in the Amazon Services LLC Associates Program, an affiliate advertising program designed to provide a means for us to earn fees by linking to Amazon.com and affiliated sites.